Submitted by James Bragg via our Facebook page. Quick view around the Fernforest Project Studio. My black cat likes sitting on things that are black and stylish. He thinks he fits in well and looks cool. Synths in order – Doepfer Modular A-100, Moog Etherwave Theremin, Moog Voyager Old School, Schlagswerg analogue drum machine, CP-251 moog control processor, Dave Smith Mopho and Tetra, Mackie Onyx firewire mixer, PC, M-Audio Oxygen 25, NI Maschine and a Monome my brother built. The music is called “Dark Glow” by me. you can find the whole track on soundcloud. Today we look back at the second of my November performances in New York. 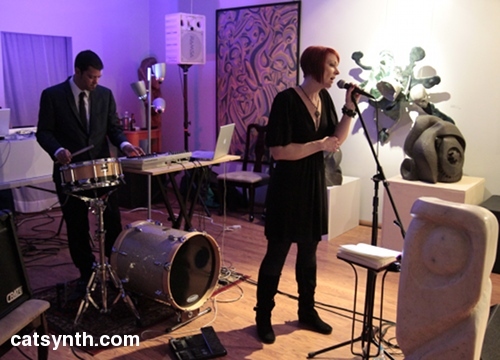 This one took place at Theater Lab in Manhattan in one of the venue’s stark white studios that served as both performance venue and blank canvas. There were several now-familar faces from east coast shows, as well as new artists that I heard for the first time. The show opened with an acoustic performance by PAS, featuring Robert L. Pepper, Amber Brien, Michael Durek and John “Vomit” Worthley with guest Carlo Altomare (one of the founders of TheaterLab) on piano. 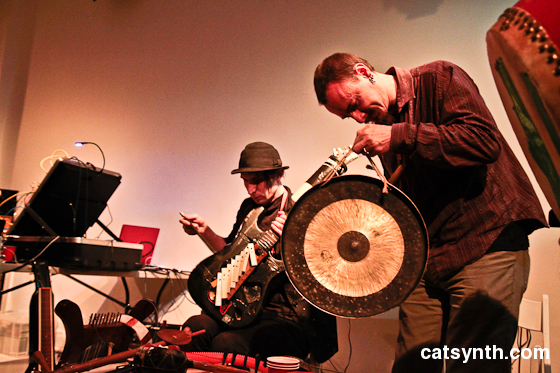 The acoustic instruments included a wide variety of percussion, strings and winds, as well as DIY combinations of objects (buckets, balloons, etc.) to produce other sounds. 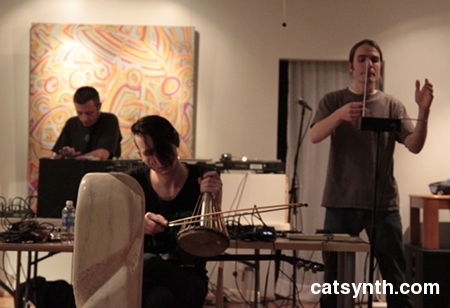 In this way, they played acoustic instruments as if they were synthesizers. PAS live with Carlo Altomare at Experi-MENTAL Night at Theaterlab. November 26th, 2011 from PAS Music on Vimeo. The particular combination of instruments and idiomatic playing gave portions of the performance an Asian feel (particularly at the beginning of the video), but even there the piano provides an avant-gard counterpoint and the overall texture moves to something more reminiscent of Henry Cowell before moving into a more experimental dramatic mode featuring Altomare soloing on piano and Pepper repeatedly chanting “Piano Man!” I like how they were able to move so easily between the different timbres and textures and rhythms without stopping, except of course for the silences that occurred in response to the instruction “Silence!” In all, a great set that set a confident tone for the entire evening. 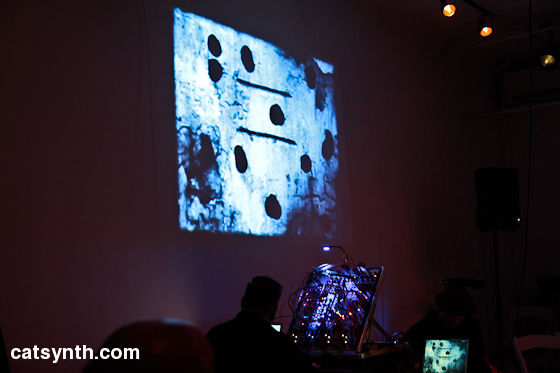 Next was a duo featuring Richard Lainhart on a Buchla synthesizer and Lucio Menegon on strings and effects. They performed a live improvised set to a film by Scratch Film junkies. The film was beautiful and mesmerizing, though I did find myself also watching the Buchla to see and hear what was happening. In general, the synth performance was subtle and blended well with the string sounds to produce an overall ambient texture, with occasional metallic and inharmonic swells. The eerie and slowly moving sound fit the abstract video, with frequently changing clips overlaid with digital effects that simulated paint and chemical treatment. At times, the harmonies and timbres seemed to approach an acoustic orchestra and choir, as one might hear in a science fiction film, while others seemed to channel the sounds of bowed metal and glass. PAS presents Experi-MENTAL Night with a duo by Richard Lainhart and Lucio Menegon at Theaterlab from PAS Music on Vimeo. 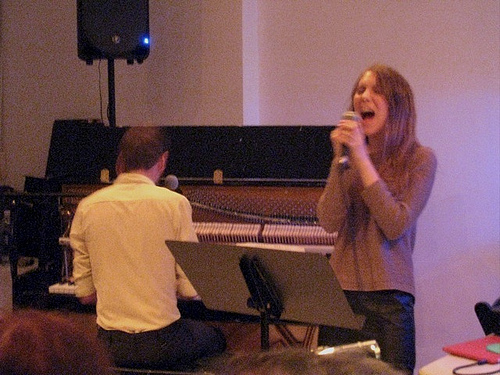 This was followed by a trio featuring Jay Pluck on piano, Julia Violet on vocals, and Michael Durek returning, this time on theremin. This was the most traditional and idiomatic of any set during the show. The songs were songs, quite lyrical and featuring traditional harmonies and melodic lines for voice and theremin. 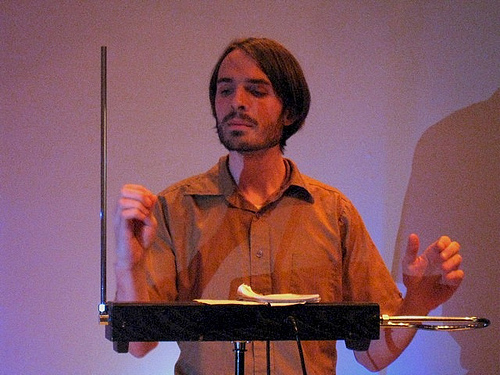 The introduction featured a theremin solo – Durek is quite good at getting standard pitching and phrasings from the instrument – set against gently rolling arpeggios of romantic chords on the piano. As Violet’s vocals enter, the music takes on a light cabaret feel, but the theremin backed with Mini-Kaoss Pad effects, continues to give it a somewhat otherworldly quality. The second song, which featured more major harmonies, had a bit of a 1960s rock quality to it, as if it was it was a song from a popular album rescored for piano and voice. 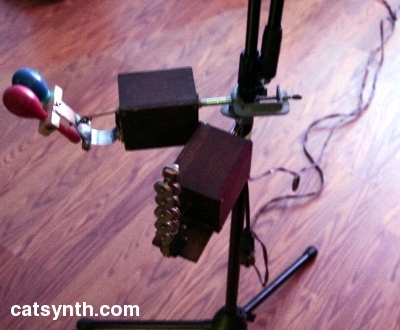 Here the theremin had a bit of a darker tone. After that it was time to take the stage. It was basically the same setup as a few nights earlier at the AvantElectroExpectroExtravaganza in Brooklyn, but with a few musical differences. I opened with a newly programmed piece that featured timbres based on the Bohlen 833 scale in which I could call up individual pitches and harmonics via the monome and iPad working together. The end result was a somewhat an ambient piece that was relaxed but with anxious undertones. Amar at TheaterLab, New York. from CatSynth on Vimeo. 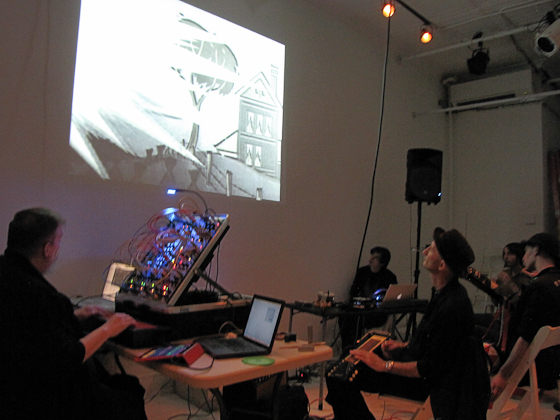 The final set featured Richard Lainhart’s film The History of the Future with a live soundtrack performed by the “Orchestra of the Future”, an ad hoc ensemble featuring many of us who had performed in the previous four sets. The film featured clips and images from old educational and demonstration films featuring depictions of possible feature technologies. It’s a snapshot of “what the future used to be” in previous eras. 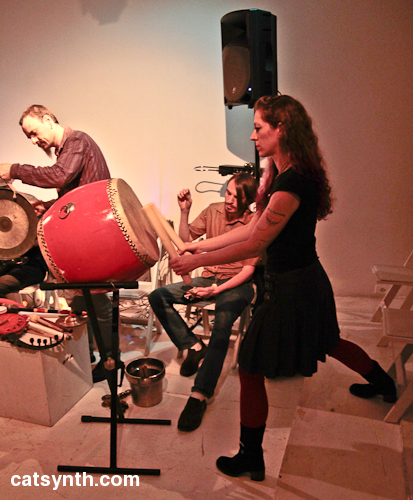 The improvised soundtrack, which featured a variety of acoustic and electronic instruments, was rich in texture and dynamism and dramatic moments. Everyone did a good job of watching what was happening on the screen and listening to each other. There were moments where it seemed like the relative volumes of instruments were off, but that was a minor issue. It was a great way to end the evening (and a bit of a relief to be in the large ensemble after performing solo). We had a decently sized audience for the show and a very positive response both during the event itself and in talking to people at the small reception afterwards. It was interesting that although this event was in New York, there were Bay Area connections both among the performers and the audience. This year has been a good one for bi-coastal collaboration and I look forward to more of it next year. From hyperdust7 on YouTube, via matrixsynth. Several pieces are going to feature the iPad (yes, the old pre-March 2 version) running TouchOSC controlling Open Sound World on the Macbook. 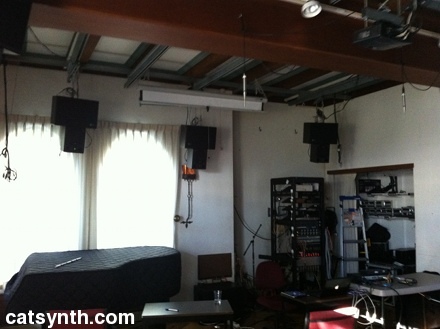 I worked on several new control configurations after trying out some of the sound elements I will be working with. Of course, I have the monome as well, mostly to control sample-looping sections of various pieces. One of the main reasons for spending time on site is to work directly with the sound system, which features an 8-channel surround speaker configuration. Below are five of the eight speakers. 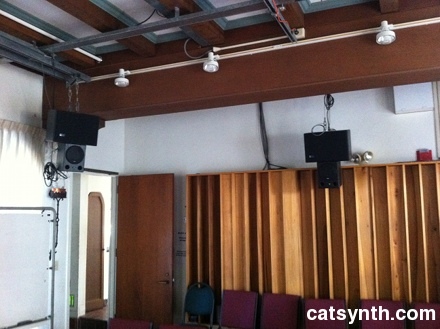 One of the new pieces is designed specifically for this space – and to also utilize a 12-channel dodecahedron speaker developed at CNMAT. I will also be adapting older pieces and performance elements for the space, including a multichannel version of Charmer:Firmament. In addition to the multichannel, I made changes to the iPad control based on the experience from last Saturday’s performance at Rooz Cafe in Oakland. It now is far more expressive and closer to the original. I also broke out the newly acquired Wicks Looper on the sound system. It sounded great! The performance information (yet again) is below. I am curious to check out Grainslide. The mlr application that I often use with the monome would be the quintessential “sample cutting app” – it has worked well for me in live performance, but I really have only scratched the surface on what I can do with this controller. From The B-Roll, via matrixsynth. 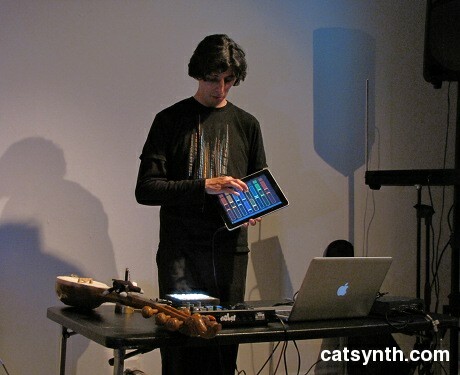 The first link takes you to an article about Press Cafe, an application by Stretta for the monome.org; and a larger version of the picture. This definitely reflects how I am feeling as this week draws to a close.